Update: Torchlight Studio: iPhone MMO Stole Assets "Wholesale"
Runic Games claims that nearly identical character models and sound files constitutes more than just "inspiration." From Angry Birds to Pocket Planes, mobile devices like the iPhone are home to plenty of popular and intriguing new games, but they also house an all-too-common type of game: the clone. The blatant rip-off. The game that doesn't just resemble its more popular counterpart - it practically traces over it. And while most clones avoid litigation thanks to being legally original - mechanics and concepts by themselves aren't covered under copyright law - some take it a bit too far. Many, like the ill-fated Triple Town clone Yeti Town, somehow manage to plunder the actual code from the original game and lay a new skin on top of it. Lifting art and sound assets is rarer, but according to Torchlight developer Runic Games, that's exactly what is going on in the new mobile MMO Armed Heroes Online. The game, made by Beijing developer EGLS and released on the Canada app store early July, seems to be original enough in terms of gameplay. It's the actual art and sounds in the game that prompted Runic Games' Co-founder Travis Baldree to call out the company on Twitter last weekend. He took several snapshots from the new game and posted them side-by-side with Torchlight models, claiming that the games' similarities go beyond stylistic choice. EGLS predictably fired back in, of all places, an online forum at TouchArcade. Serena Zhang wholly denied Baldree's accusations, claiming that similarities come from the team members taking "inspirations from other games and movies" and insisting that, regardless of how inspired they are by a single game, it does not constitute theft. Zhang also compared the protagonists of the two games, pointing out that the models do not match exactly. For example, the Wizard protagonist in Armed Heroes Online is female, while Torchlight's Alchemist is male. The final defense Zhang put forth is that Torchlight and Armed Heroes Online both draw inspiration from Blizzard and its seminal games World of Warcraft and Diablo. Zhang emphasized that Torchlight itself borrowed heavily from other games, including Fate and Diablo II, and concluded that "there is never such a game which has no similarity at all with games of its same type, including Torchlight." 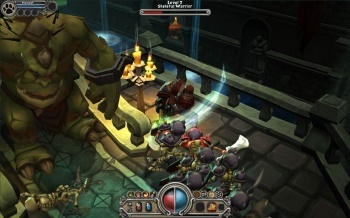 Baldree responded to the post, claiming that the sound files packaged with Armed Heroes Online share filenames - including typos and unique monster names - with Torchlight. He dismissed the rationalization that the similarities were just inspiration, stating, "I have no problem with inspiration. We are obviously inspired by Diablo, and make no bones about it. But we don't include any Diablo artwork or sounds in our game." To prove his point further, he posted two more comparison shots using the models Zhang used in the original post, again showing eerie similarities with Torchlight. Regardless of whether Apple takes Armed Heroes Online off the app store - a move Baldree said he would be requesting of the company - the debacle once again raises a slew of age-old questions about the place of inspiration and borrowing in game development. How much inspiration is too much? Is so-called 'evolutionary' development the best way to innovate? And when are developers going to stop cloning Doom? Update: Apple has removed Armed Heroes Online from the Canada app store. EGLS released a response statement, saying it will attempt to get its game back online by modifying the disputed assets and sending documents to Apple to prove the game's originality.